Tynker’s Character Creator is one of the many reasons students love using Tynker. Feedback from our users inspired us to create a new set of characters that reflect the kids who are learning to code with our products. With the new kid characters, students can create characters that look like themselves and add realistic, high-quality animations to their coding games and projects. The kid rig has built-in emotion animations, which make it easy to create engaging storytelling projects. New kid characters can jump for joy, blush, cower in fear, cry, talk, walk, run, get angry, and much more. This wide array of animations makes it easy for new programmers to create interactive scenes, stories, and games. Students can mix and match hair, eyes, skin, pants, shirts, hats, and more to create custom characters to use in their projects. They can put any outfit on any character and even combine different outfits, allowing them to create unique characters. They can make boy and girl characters who are doctors, football players, ninjas, fairies, wizards, medieval characters, goblins, knights, and more. With these new characters, students can use coding to tell beautiful, realistic stories about their own lives and their fantasy worlds. Access these kid characters and as well as dragons, monsters, and adults by signing up for a free account. Students can earn the locked characters by completing courses and free activities to gain XP points. Every time they level up or complete a lesson in a course, they unlock a new character. The new kids are also available on our app, so be sure to download the newest version to access them. 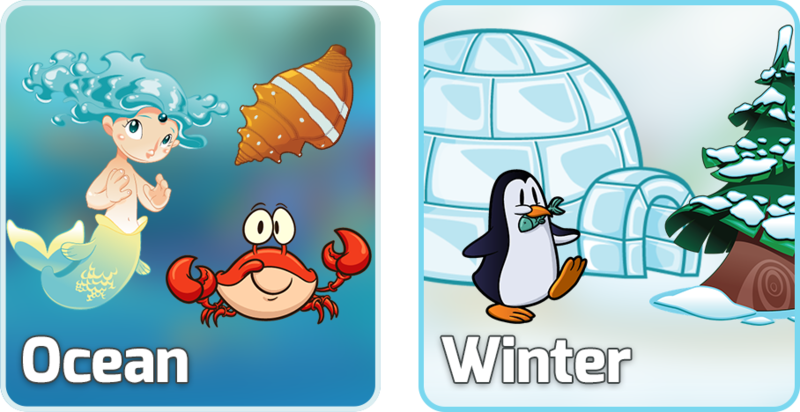 This release also includes new ocean and winter assets! New to Tynker? Take a look at our programming courses, which teach children how to make games, stories, and other projects. They can learn how to program advanced animations with these built-in characters, simulate physics, control drones, and more.